Over past eight or so months that I have been sewing for my little one, I have quickly accumulated a pretty sizable stash of sewing supplies and fabric. 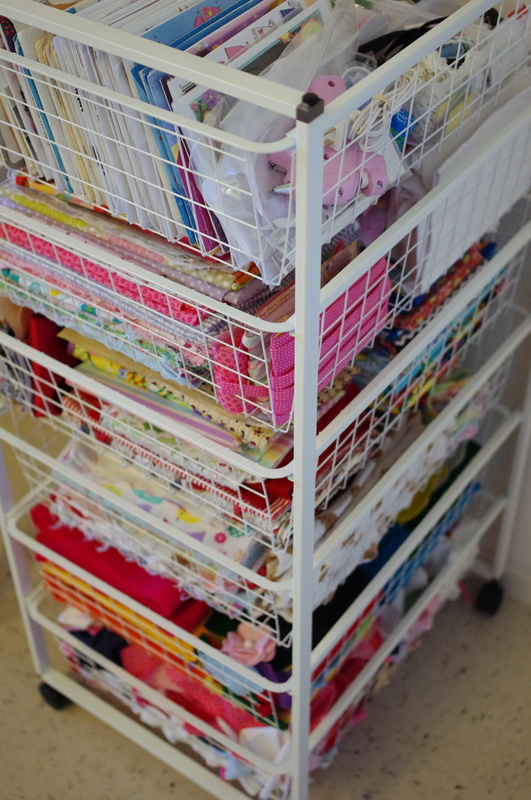 But due to the limited space in our apartment, my sewing stuff never really had a permanent or organized home…until now! While looking for shelving units online to organize our storage closet, I came across some really great rolling carts. I realized that this was perfect for my sewing supplies! I don’t want them to be anywhere Hannah can get to—she’s reveling in this new walking phase and has used her newfound freedom to open every single drawer and cabinet and empty the contents with zeal while I chase after her trying to pick it all up—but I want to be able to quickly and easily access my supplies while I’m sewing and she’s napping or down for the night. A rolling cart is the perfect compromise. I can keep the cart in the closet while she’s up and about, then roll it next to my sewing table while she’s asleep. Genius! My cart is part of the Antonius closet storage system from Ikea. I was originally going to get the smaller four drawer cart but my wonderful husband talked me into getting the six drawer cart. It’s lucky he did because I’ve pretty much maxed out the storage capacity of each drawer. There are a few different options: no top or hard top, plastic bins or wire baskets, with or without castors. 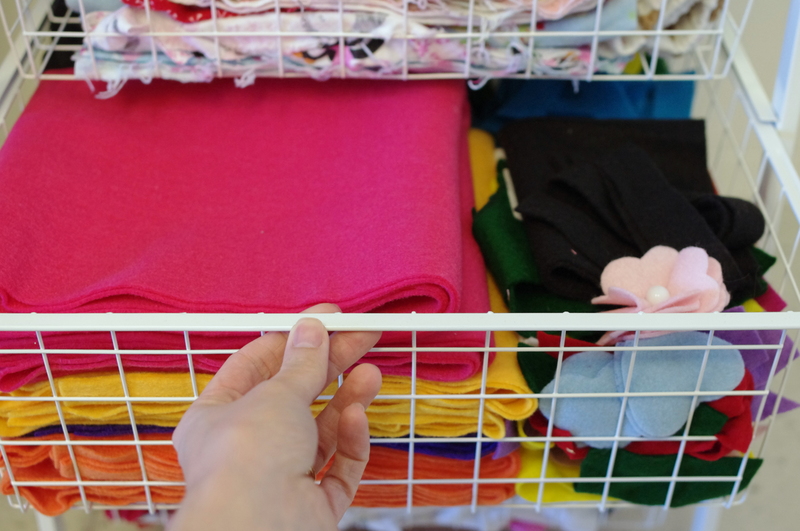 Mine has no top, wire baskets (I thought this would keep the fabric aired out and easily visible), and castors. 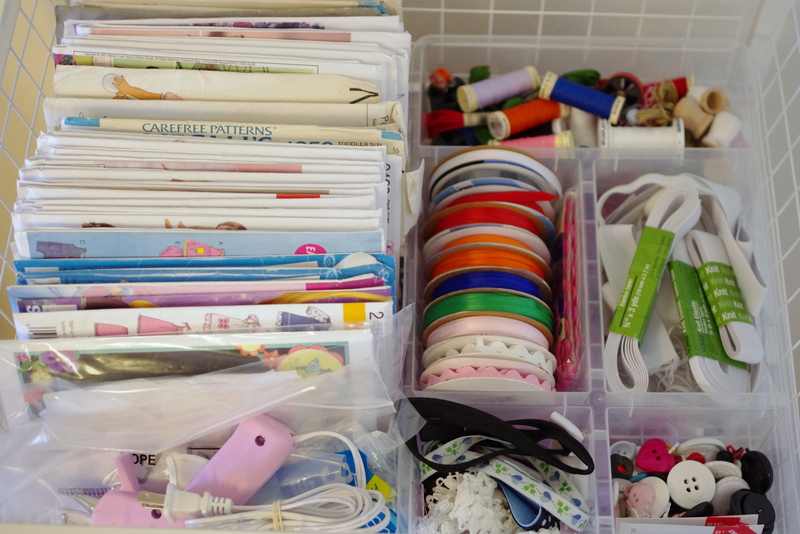 I also got a basket insert to organize buttons, ribbon, etc. so that my sewing table is almost entirely bare except for my sewing machine and serger. It took me many hours to sort through everything and put it all neatly away in the drawers but it was definitely worth it. 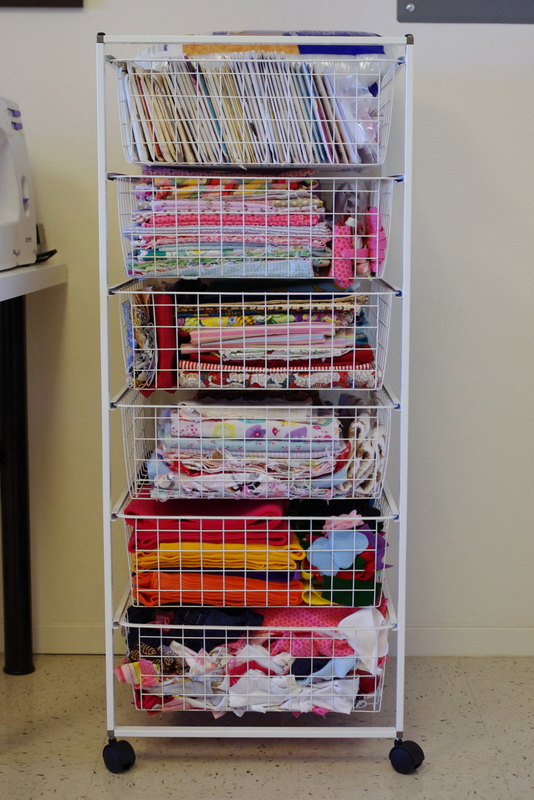 I absolutely love my sewing supplies cart! I can now quickly and easily find what I’m looking for, not to mention, remember what I already have on hand but forgot about because it wasn’t visible or easily accessible.